I am walking. I am always walking, it seems. When I walk, I feel more myself, which is to say, I feel I can flow between selves more easily. A dancer I once met in the seaport town of Akko, in Israel, showed me how to walk with grace and elegance. “From the hip, not the knee. Like this.” And she swayed in front of me, her blue-and-white skirt swirling around her ankles like foam. The phone is cradled to my ear. The sky is an almost-black blue that feels like a secret. It’s too interior to be blanketed over our heads – yet it spreads in all directions with perfect composure and clarity. Here I am, it seems to say. All my secrets are yours. I’m talking with my Dad – a daily ritual like walking. When I walk, my soles touch earth. When I talk to Dad, my soul touches a place of grounding and surety. These are some of the most beautiful words in the world I think. He listens. She listens. They listen together. I walk past a Russian Orthodox church, tucked away off 16th Street. Its golden onion dome gleams quietly in the evening light. A few more steps and I’m wending through old neighborhoods of comfortable houses and ample gardens. one in full bloom; the other, an unopened bud. I gasp, and tumble headlong into a memory – of arriving back in London from a visit to Paris, a trip notable for its remarkable barrage of beauty. I was walking home from the train station to my student digs, when I looked down. 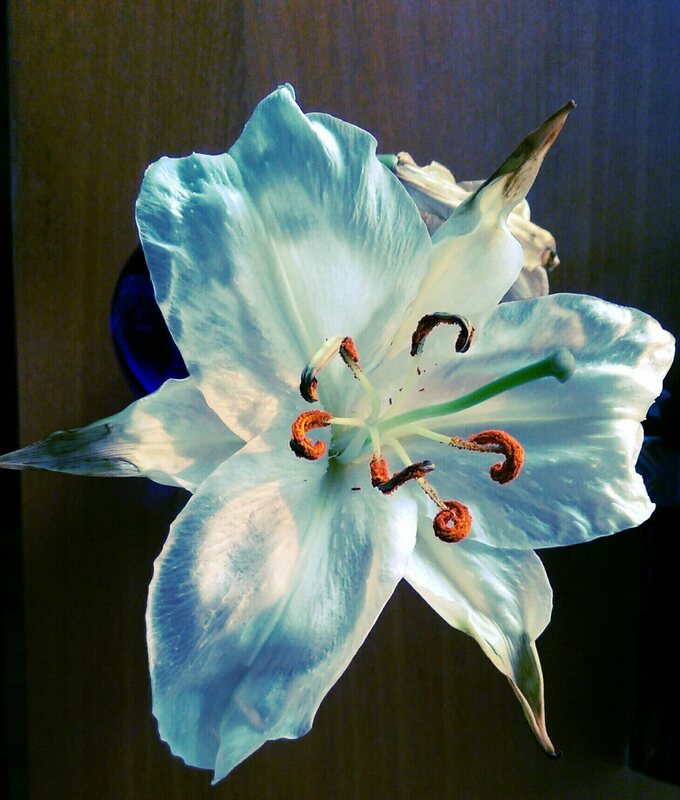 On the sidewalk in front of my residence was a handful of discarded lilies. I swooped down, picked them up, and placed the rescued flowers in a jar on my window sill. I’m sharing all this with Dad, as I bend down to pick up the two white lilies. 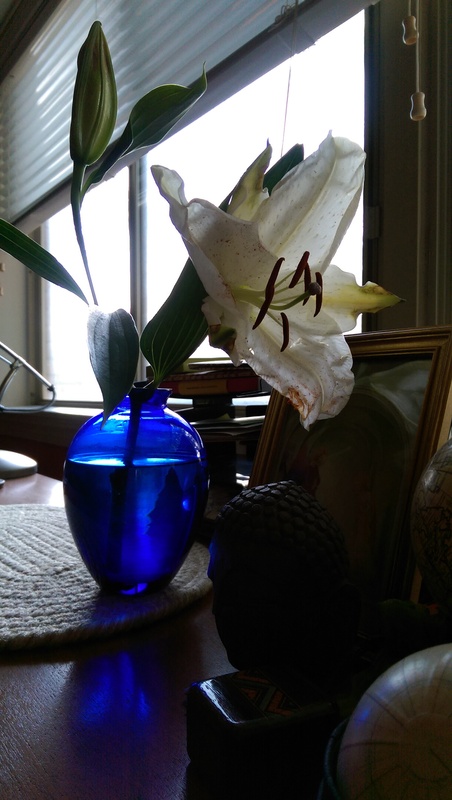 Back home, I place them in a cobalt vase, near a postcard of Fra Angelico’s Annunciation.